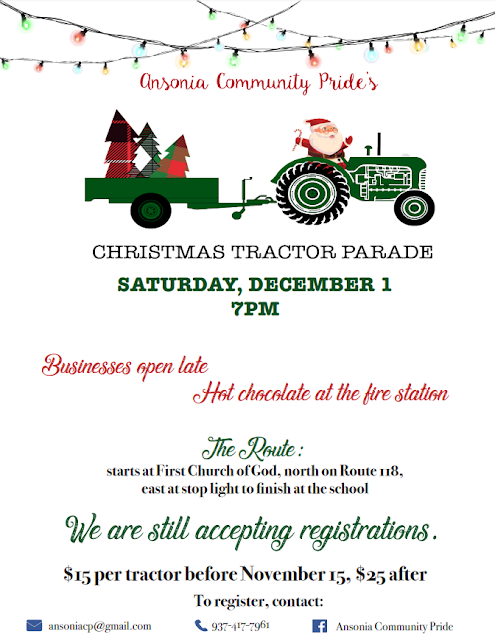 Ansonia Community Pride's Christmas Tractor Parade is Now Accepting Entries! 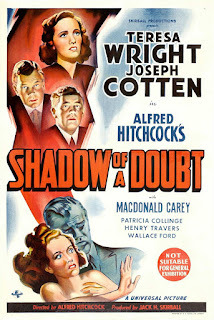 Alfred Hitchcock's 1943 film Shadow of a Doubt is a suspense classic that continues to unnerve audiences to this day. When Charles Oakley (Joseph Cotten) arrives at this sister's home in California, the entire family is happy to see him, especially his niece and namesake, Charlie (Teresa Wright). But when two detectives show up in town looking for the Merry Widow Murderer, Charlie begins to suspect her uncle might not be the man she thinks he is. Co-written by Thornton Wilder (Our Town), the film plays on the peculiarities of small towns and close families to weave a web of intrigue as tantalizing as it is troubling. Joseph Cotten is perfectly cast, projecting sinister suspicion one minute and affable charm the next, tugging poor Charlie's loyalties in opposite directions as she learns more about his crimes. Teresa Wright does her own balancing act as Charlie, moving between fresh-faced innocence and shrewd scheming as she seeks to protect her naïve parents and younger siblings from the danger in their peaceful home. 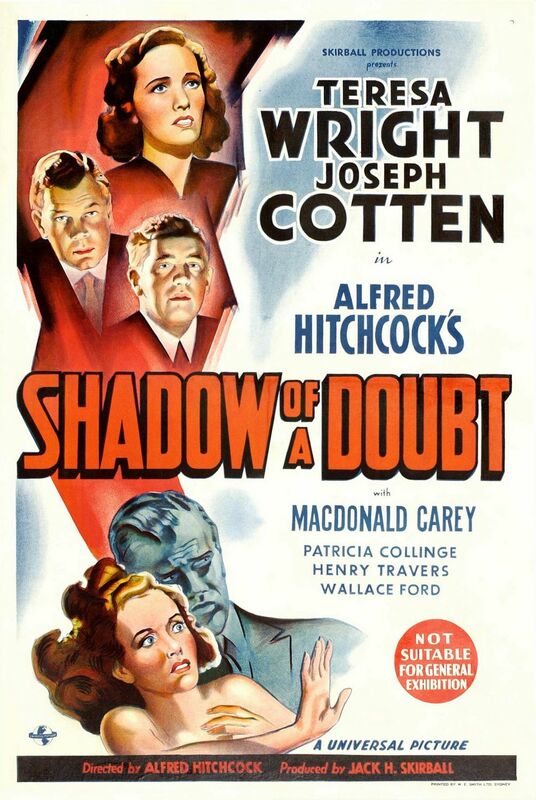 Join us on Tuesday, November 6, at 6:30 p.m. at the Greenville Public Library, as we screen this classic thriller as part of GPL's Third Floor Film Series. Free popcorn, candy, and soft drinks will be provided, and David Nilsen will lead a brief discussion after the film. We hope to see you there. The Greenville Public Library is proud to host author E. Scott Martin at its next “Author Sign & Share” on Thursday November 1st at 6:00 p.m. This event is always held in the Reference Room on the second floor and registration is not required. 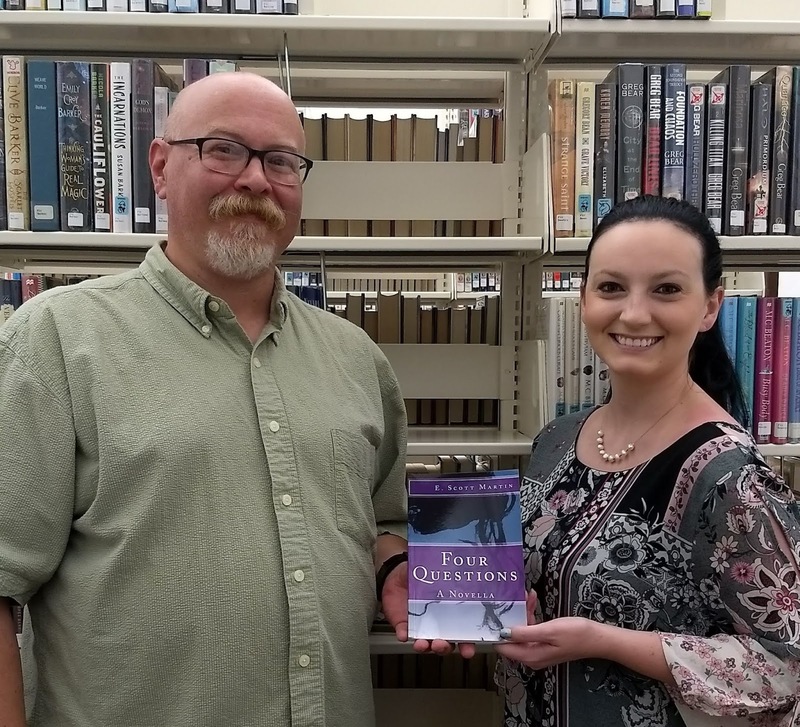 Erik Martin is a reporter for The Daily Advocate and has released his first book Four Questions: A Novella. Erik, whose pen name is E. Scott Martin, will discuss the process he went through in order to get his book written and published. A book sale and signing will follow the presentation. Erik graduated from Huntington University with a BA in English in 1994. Prior to his work for The Daily Advocate, he worked as editor of Coin Values Magazine and as a writer for Coin World Magazine. He currently resides in West Milton with his wife and two children. When asked what primary message should readers take away from Four Questions, Erik said it is the idea that common people can accomplish big things, through determination and a little luck. Join us for an interesting, inspiring evening! The church is located at the west edge of Pitsburg, OH, at 8376 Pitsburg-Laura Road. The public is invited to this gospel concert and a freewill offering will be accepted. Refreshments will be served in the fellowship hall following the concert. For booking information, you can contact John at 937-423-7827 or Kent at 937-621-5494. COLUMBUS, Ohio The Darke County Commissioners are joining the County Commissioners Association of Ohio (CCAO) to call for a stronger partnership between state and county government as they released “Stronger Counties. Stronger Partnership. Stronger Ohio.,” a briefing guide detailing county funding needs and asks that need to be addressed in future state budgets and legislation. State polices enacted over the last decade have placed counties in the difficult position of balancing revenue loss with escalating costs. The loss of the Medicaid managed care organization (MCO) sales tax, severe reductions in the Local Government Fund (LGF) and the phase out of the tangible personal property tax (TPP) has eliminated approximately $351 million per year in county revenue statewide. “The state’s revenue policy decisions, combined with our growing costs, have depleted reserves and delayed capital projects. It can be a struggle to provide the services that Ohioans need,” Commissioner Matt Aultman said. “We must have the state’s financial commitment to ensure we have the necessary revenue to provide county residents with the services that are critical to maintain necessary county services “. Enjoy a special evening in the woods, circled around a warm, autumn campfire. The last Darke County Park’s campfire of the year will be at Shawnee Prairie Preserve on Friday, November 2 at 6:30pm. Through stories, song and activities we’ll welcome in the coming season of snow! Discover how the wildlife of Shawnee Prairie Preserve prepares for winter while listening to tall tales and legends. Don’t forget we’ll save some time for songs and roasting marshmallows too. Don’t miss this naturalist led fun, free family event! Be sure to bring a chair, flashlight and dress for the weather! Registration is required for this free event. For questions about this or any other park district programs or to register for the class, please call 548-0165. GREENVILLE, OH – A Night Out with the Wavaires and Jazz Scene is scheduled for Friday, November 9th at 7:00pm at Memorial Hall. This year’s theme is “The Greatest Show”. The concert will begin with the Wavaires performing selections from “The Greatest Showman”. The Wavaires will perform additional selections, including “Cruisin’ for a Bruisin’”, “May it Be” and a tribute to Military personnel with “The Armed Forces Salute”. The Wavaires will also be performing a medley of selections from the movie “Sing”. 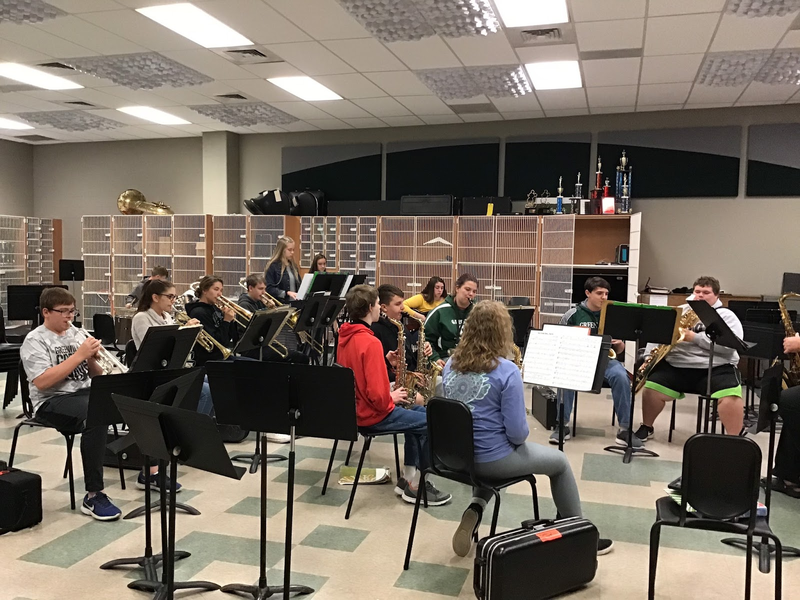 The Jazz Scene will perform various Disney tunes, including “You’re Welcome” from “Moana” and “Hooked on a Feeling.” The jazz band will also perform some classic rock pieces, such as “Low Rider”, “Vehicle” and “Faith”. 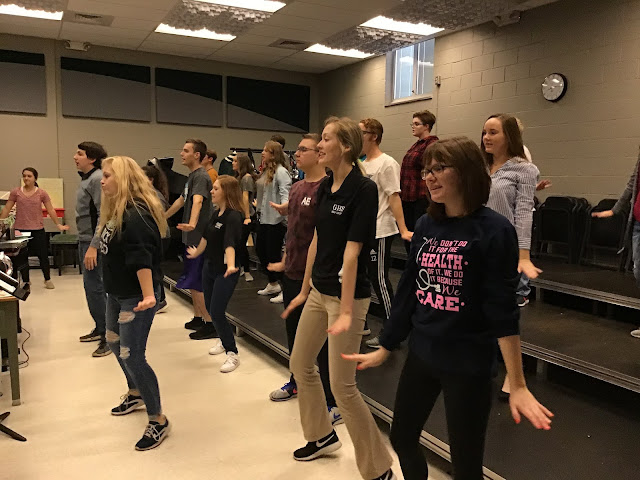 Combined together, the Wavaires and Jazz Scene will present a preview of Holiday songs, as well as a grand finale, featuring senior, Gracie Pell, with “Night and Day”, followed by the groups performing their own rendition of the song “Skyfall”. Tickets for the show on November 9th will be available at G&G Floors Fashions on Wagner Avenue Monday- Friday from 9:00am- 5:00pm beginning on Wednesday, October 31st. Any remaining tickets will also be available for purchase the night of the show in the ticket booth at Memorial Hall. Pre-sale tickets are $4.00 for students and $6.00 for adults. All seats purchased at the door are $8.00. Please plan to purchase your tickets early to guarantee a better seat selection. The GHS Choirs are directed by Mrs. Chelsea Whirledge. The GHS Jazz Scene is directed by Mr. JR Price. The choreographers for the show are Brooke Jendrusik and Sierra Cress. Greenville BPW Club features Author Jodie Bohman! Greenville, OH. The Greenville Business and Professional Women’s Club will host their monthly dinner meeting, Thursday, November 8th at the Brethren’s Retirement Community’s Brick Room at 6:30 pm. The meeting will be hosted by the IDP (Individual Development Program) committee with Chair Dorothy Poeppelman, and members Michelle Hook, Louisa Kennedy, Jane Carroll, Erica Menke, and Kristi Strawser. 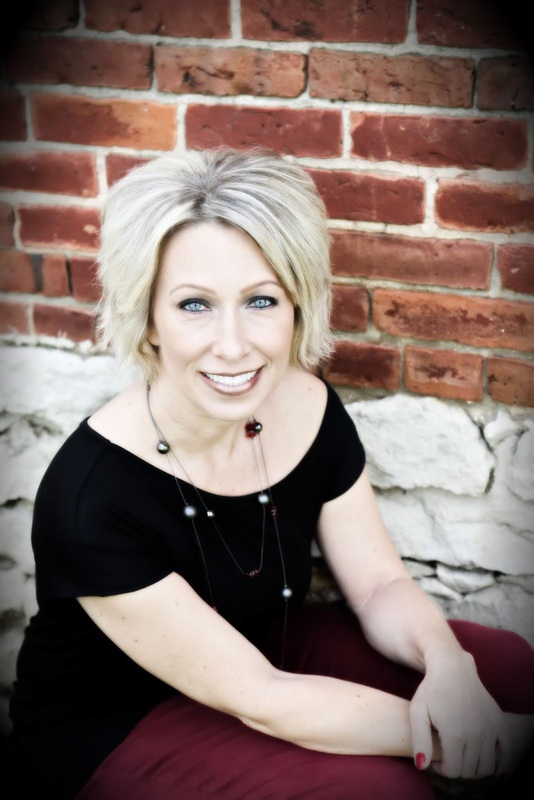 The program will include a presentation by Jodie Bohman, Superintendent’s Secretary at Versailles School and published author. Bohman, mother of two daughters is speaking about her creative imagination and putting her thoughts together for her first book ‘And I Believe’. This book was published in August, 2014. While the story is made up, Jodie knew “way too many people who have fought cancer, are currently fighting cancer, or have lost their battle with cancer, and wanted to write a story about it”. She has since written a sequel ‘Mattie ’ which picks up 18 years where ‘And I Believe’ left off, which should be available by December. Bohman is currently in the works of writing her third book, ‘A Bottle Full of Demons’, which picks up where ‘Mattie’ leaves off. The BPW club will also have available for sale ‘super raffle’ tickets. Winners will be drawn at the December 13th meeting. The raffle is a chance to win one of five prizes: a 2 night stay at the StoneHead Ridge Cabin in Brown County, Indiana (Debbie Niekamp), a Frederic Duclos Sterling Silver necklace and earrings (Wieland Jewelers), a 39” Element Smart TV (Your Expert Mortgage Team of John & Kristina Heath), Suds in a Bucket Cleaning/3 hrs. (Loure Bohn), and a 3 speed hand blender (KitchenAid Experience). Super Raffle tickets are available at Merle Norman at 309 S. Broadway, Greenville or by contacting Susan Shields at 937/548-2592, Debbie Niekamp at 419/305-2178 or any BPW member. The winner does not need to be present to win. Tickets are $2.00 each or 6 for $10.00. All proceeds are used to grant scholarships to the young women of Darke County. The Greenville BPW Club’s mission is to achieve equity for all women in the workplace through advocacy, education, and information. For reservations please contact Vicki Cost at vcost@coxinsurance.com by noon on Monday, November 5th. The cost for dinner is $12.00. “Kathakaar, The Spinning Storyteller” will explore the multi-cultural history of India in an interactive presentation for kindergarten through third grade students in all local public schools from October 29 through November 2 as part of Darke County Center for the Arts’ Arts In Education series. 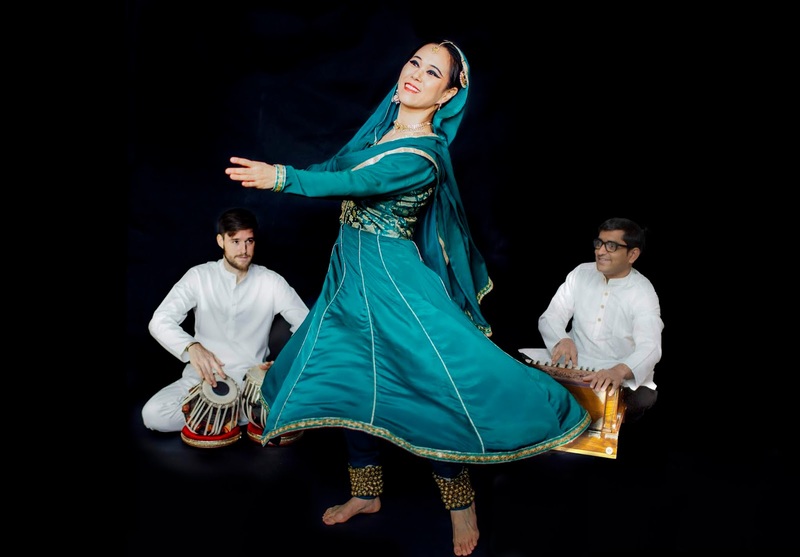 According to DCCA Artistic Director Keith Rawlins, dancer and tabla player Jin Won infuses her own creativity into her performances of Kathak, a form of Indian classical dance which uniquely tells stories through movement and music. “Her strong and graceful performances share the beauty that emerges when different cultures interact,” Mr. Rawlins explained. “Her fascinating program engages audiences of all ages,” he stated. 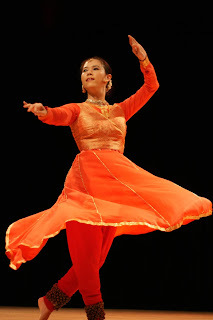 In ancient India, Kathak dancers were traveling bards known as Kathakaar; the tradition is traceable to 400 B.C.E. South Korean artist Jin Won developed a passion for Indian arts that led her to live in India for over 15 years, obtaining training in tabla , an Indian musical instrument consisting of a pair of small drums, as well as dance; she has created this program to share her enthusiasm for the rich and fascinating culture she has adopted. Mr. Rawlins says that the dynamics and power of Kathak will be expertly showcased technically and expressively, leaving youngsters with a clearer picture of the diverse people of India and their myriad cultural backgrounds. DCCA’s Arts In Education series annually presents high quality professional artists to students in every grade of all local public schools; these programs are free and open to the public. Arts In Education is sponsored by Bach to Rock, DP&L Company Foundation, Richard Baker, Greenville VFW Post #7262, Greenville Federal, Maid-Rite Sandwich Shoppe, Gordon Orthodontics, the Wes & Patti Jetter Fund, the Mandy Green Fund, Edison State Community College, The Early Bird & Blue Bag Media, Littman-Thomas Agency, and Wayne Health Care. DCCA also receives local support from the John R. and Miriam H. Knick Fund of the Darke County Foundation, The Ketrow Foundation, Lydia E. Schaurer Memorial Trust, Harry D. Stephens Memorial, and DCCA memberships, as well as funding from the Ohio Arts Council, the state agency that funds and supports quality arts experiences to strengthen Ohio communities culturally, educationally, and economically. “Kathakaar, The Spinning Storyteller” will also be presented for audiences of all ages as a part of DCCA’s casual Coffeehouse Series; this performance takes place on Thursday, November 1 at the Union City Arts Depot. The show begins at 7 p.m. Start times for DCCA’s Arts In Education programs are coordinated with school schedules; for more information, contact DCCA at 937-547-0908 or dcca@darkecountyarts.org. white or a variety of color printing options. GREENVILLE – The Empowering Darke County Youth Board of Directors and volunteers are pleased to introduce a new logo for the organization. It was designed by Middle School (5-6) Visual Arts Educator Julie Brewer. Mrs. Brewer expressed her thanks, noting the funds will help purchase shelving for ceramic projects in her class. There will be a Marketing Committee meeting at the Greenville Public Library Nov. 1 at 6:30 p.m. in the Reference Room on the second floor. There will also be a Volunteer meeting at Edison State Community College on Wagner Avenue Nov. 7 at 6:30 p.m. Both meetings are open to community members of all ages who want to help. For more information, email empoweringyouth101@gmail.com or contact (and like us) on Facebook. Donations are gratefully accepted at PO Box 1113, Greenville, OH 45331. 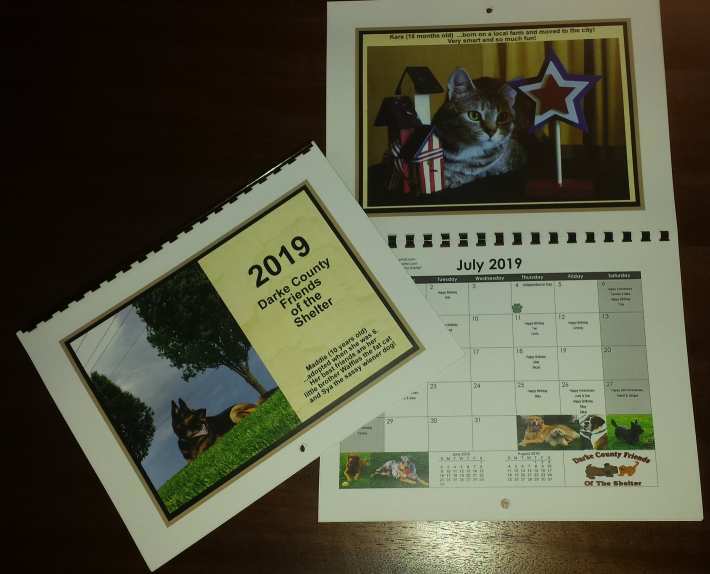 Since 2007, the Darke County Friends of the Shelter have assembled a 12 month calendar as a fundraiser for their several projects. The monthly pictures are made up of local pets. The 2019 calendar is now available and has photos of any kind of pets. The calendars make great gifts for Christmas, Birthdays, Anniversaries, etc. and are sold at the Shelter (5066 County Home Rd., Greenville, just beyond the Sheriff’s Office). You also can purchase them from one of the shelter members. The price per calendar is just $10. The organization also wants to announce that this years “Pet Pictures with Santa” will be on Saturday November 17, 2018 from 10:00 am till 2:00 pm in the Walmart garden center. Greenville, OH: This month marks 15 years in business for local mortgage broker KTL Performance Mortgage. The organization specializes in FHA, VA, Conventional, and USDA home loans, and processed over 700 loans so far in 2018. Established in Oct. 2003 in Greenville, KTL Performance Mortgage began with 3 employees whose sole focus was on providing Conventional home loan products to local homebuyers. The company has since grown to 23 employees and provides home financing and refinancing solutions for clients in Ohio, Indiana, Kentucky, and Florida. The organization works with over 12 different lenders, allowing them to offer a wide variety of flexible loan solutions and competitive interest rates to their borrowers. KTL Performance Mortgage is owned by Bill Mason, Desteni Mason, Kristina Heath, and John Heath. 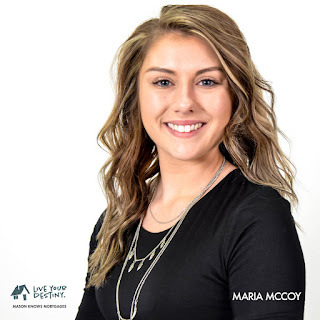 Greenville, OH - Mason Knows Mortgages (A Performance Mortgage Team) in Greenville, Ohio is happy to announce that Maria McCoy has recently become their most recent licensed Mortgage Loan Originator. Maria will be serving the team’s clients throughout Ohio and Indiana, and will continue to offer ongoing support for our other Loan Officers and Originators. Maria brings a fresh perspective to the Mason Knows Mortgages Team. She is passionate about helping first time homebuyers realize their dream of homeownership by listening to their needs and future desires, and pairing them with the best loan program to fit their lifestyle. The Mason Knows Mortgages Team helps people in Ohio, Indiana, Kentucky and Florida achieve their unique dreams of home ownership. We find the right mortgage solution for each person’s life situation and serve as a guide and partner throughout the process of achieving their dream. What a Girls Wants Guest Night Committee pictured from left to right: Deb Niekamp, Susan Shields, Susan Fowble, Deb Shiverdecker, Desteni Mason, Vicki Cost and Kristina Heath. Greenville, OH. 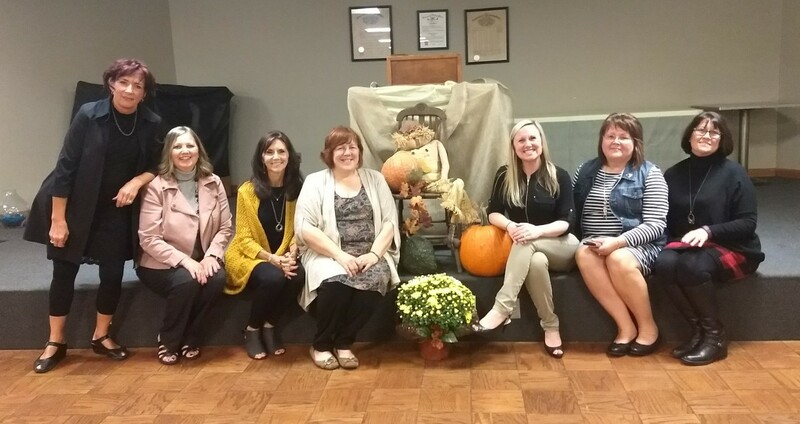 - Greenville Business & Professional Women’s Club (BPW) guests and members recently enjoyed shopping, food and fashion at their successful annual guest night “What a Girl Wants” event on October 11th. The evening started with shopping in downtown Greenville at Merle Norman, Sadie Grace, Sweet Annie’s Cabin, Youniques, Expressions of Tyme, Natural Path, Shelly’s Antiques & Décor, Wielands, and 4 One Apparel in Arcanum. The event then moved to the VFW on Ohio Street with social time and appetizers catered by J’s Country Store. Many silent auction items were available for bidding along with shopping at various vendor tables. Several door prizes were given out and a 50/50 raffle drawing was held. Committee chair Debbie Niekamp along with committee members Susan Shields, Desteni Mason, Kristina Heath, Deb Shiverdecker, Vicki Cost and Susan Fowble treated those in attendance to a fashion show with Kirsten Bergoff showing styles from Sadie Grace and Kristina describing designs from 4 One Apparel and Youniques. The ‘super raffle’ was launched with a chance to win one of five prizes: a 2 night stay at the StoneHead Ridge Cabin in Brown County, Indiana (Debbie Niekamp), a Frederic Duclos Sterling Silver necklace and earrings (Wieland Jewelers), a 39” Element Smart TV (Your Expert Mortgage Team of John & Kristina Heath), Suds in a Bucket Cleaning/3 hrs. (Loure Bohn), and a 3 speed hand blender (KitchenAid Experience). Super Raffle tickets are available at Merle Norman at 309 S. Broadway, Greenville or by contacting Susan Shields at 937/548-2592 or Debbie Niekamp at 419/305-2178 or any BPW member. The drawing will be held at the Club’s meeting on December 13th. The winner does not need to be present to win. Tickets are $2.00 each or 6 for $10.00. Special thanks to the following vendors, silent auction donors and members for making this event a success: Deb Niekamp, John & Kristina Heath, Loure Bohn, Wieland Jewelers, KitchenAid, Sadie Grace, Youniques, 4 One Apparel, Pam Sharp (Merle Norman), Leona Douglas (Brown Bag Soap Company), Park Lane Jewelry (Glenna Martin), doTERRA (Sheila Voisard), The Flower Patch, Hairology Off Broadway, Darke County Center for the Arts, Greenville National Bank, Second National Bank, Greenville Federal Bank, Leigh Fletcher, Mary Piel, Creations Salon, Helen’s Flowers, Longaberger (Kathy O’Dell), Mary Kay (Brenda James), Damsel in Defense (Melissa Barhorst), Pampered Chef (Tammy Riffle), Scentsy (Jordan Hart), Sunset Awards, Susan Fowble, Susan Shields, Biller Stamps & Engraving (Maria Moore), Blue Lantern Tea House, Casey’s, The Coffee Pot, Darke Co. Park& Recreation, Domino’s, Hansbarger’s, Hot Heads, JT’s Brew, Kennedy Vineyard (Louisa Kennedy), Eileen Litchfield, Mason Knows Mortgages (Desteni Mason), McDonalds, The Merchant House, Montage, Norwex (Tammy Dietrich), Nature’s Path, Pink Zebra (Brenda Dirksen), Plexus (Sonya Crist), Professional Eye Care, Posh (Kim Bohlet), Rapid Fire Pizza, Signature Home Style (Hillary Schlieger), Tastefully Simple (Deanna Harmon), The Bistro, Betty Via, Thirty One (Kristen Harmon), Escape Spa (Amanda Baker), Sloopys, Buffalo Wild Wings and VFW Post 7262. The Greenville BPW Club’s mission is to achieve equity for all women in the workplace through advocacy, education, and information. The Club holds fund raisers throughout the year to raise money to grant scholarships to the young women of Darke County. Evening meetings are held the second Thursday of every month for a dinner meeting. Those interested in learning more about the Club can contact Membership Chair Sonya Crist at 937/423-3657 or sonyacrist@gmail.com. The public is invited to walk at the high school from 6 to 8 p.m. Mondays through Thursdays beginning Monday, Nov. 5, and continuing through March 28, 2019. There will be no walking during Christmas break. Also, if school is closed during a day or there are parent/teacher conferences, then it will be closed to walking that evening. A complete calendar of available walking dates will be available to walkers at the sign-in desk. Nationally-known pianist Alpin Hong recently opened Darke County Center for the Arts’ 2018-2019 Arts In Education series as well as the Artists Series at Henry St. Clair Memorial Hall in Greenville to standing ovations and rave reviews. Darke County Center for the Arts recognizes Richard Baker for his support of the 2018-2019 Celebrating 40 Years Season as well as the Artists Series and Arts In Education Programming. “Richard Baker's support of DCCA and our Arts In Education programming makes it possible to present engaging and entertaining programs, and enables all Darke County public school students to experience a culturally enriching artistic program each year,” stated Andrea Jordan, DCCA Executive Director. DCCA’s Arts In Education series annually presents outstanding professional performing artists to students in every grade in all local public schools at no cost to the students. Other programs in the series this school year include Kathakaar, The Spinning Storyteller for kindergarten through third grade students, a songwriting workshop with singer/guitarist Jonathon Kingham for high schoolers, and troubadour Lee Murdock presenting the history of the Great Lakes through music for fourth- through sixth-graders. DCCA’s A.I.E. programs are free and open to the public. The next DCCA Artists Series presentation is The Piano Men: A Tribute to Elton John & Billy Joel on Saturday, March 30, 2019. The Piano Men treats you to all of the excitement that only Billy Joel and Elton John together in concert together can create. All of their hits come alive when performed by Broadway veterans Craig A Meyer and Donnie Kehr, accompanied by amazingly talented backup singers and The Rocket Band of all star musicians. Darke County Center for the Arts presents and promotes performing and fine arts encouraging cultural enrichment. 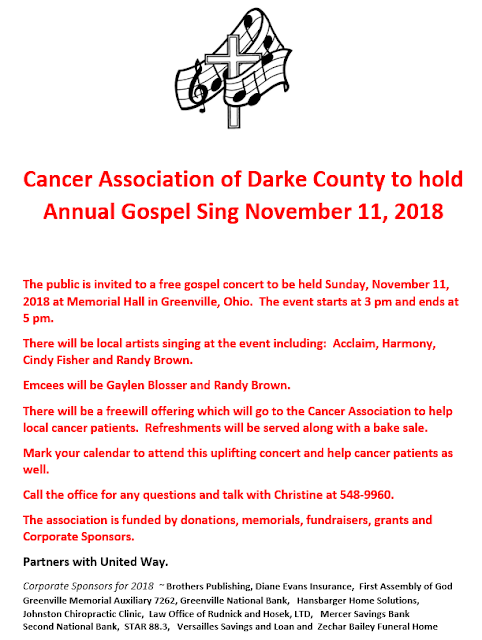 For more information, or to purchase tickets contact DCCA at (937)547-0908 or www.darkecountyarts.org. 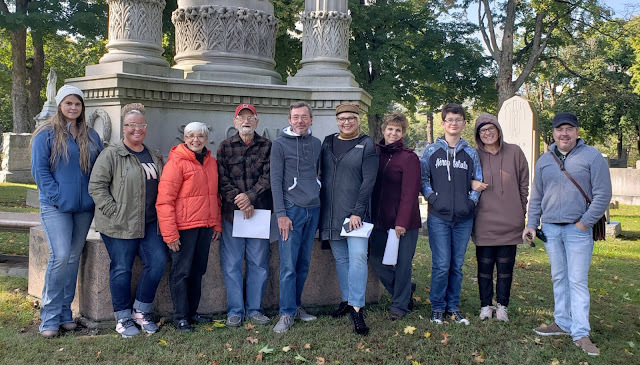 Some of the DCCA Ghost Walk guides and actors take time for a photo in Greenville Union Cemetery as they prepare for the upcoming event. The annual Ghost Walk in downtown Greenville will begin at 7:30 p.m. on Friday, October 26, Saturday, October 27, and Sunday, October 28. 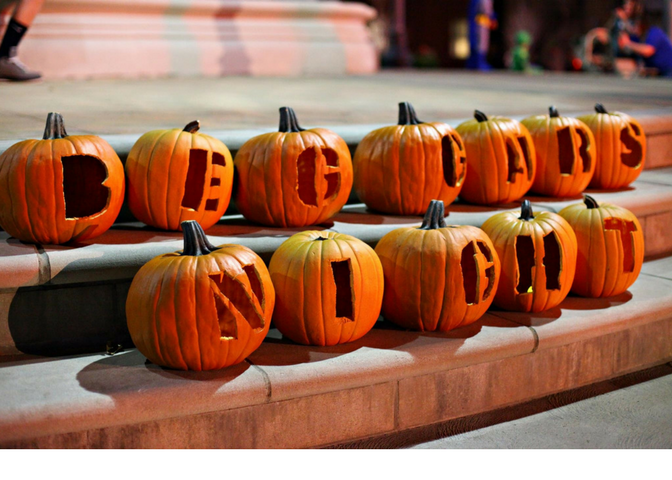 The new Ghost Walk in Greenville Union Cemetery will be on Sunday, October 28 at 4:30 p.m. and again on Halloween night, Wednesday, October 31 at 6 p.m.
Darke County Center for the Arts will continue a long-standing Halloween-season tradition when they host their annual Ghost Walk in downtown Greenville beginning at 7:30 p.m. on Friday, October 26, Saturday, October 27, and Sunday, October 28; and the organization will also host a new Ghost Walk in Greenville Union Cemetery on Sunday, October 28 at 4:30 p.m. and again on Halloween night, Wednesday, October 31 at 6 p.m. Tour guides who will lead the Walks are Michael Bitner, Marilyn Delk, Tim Nealeigh, and Keith Rawlins. Actors who will spin additional spooky tales are Gail Bankson, John and Karen Burkett, Nick Colby, Tanna Cornett, Larry Delk, Kianna Dishman, Katheleen Nealeigh, Wyatt Reed, Jan Roestamadji, Jamie Stocksdale, and Heather Voisard. Many of the tales to be spun are based on stories collected by Arcanum-area resident Rita Arnold which tell of local ghostly encounters; some newly discovered spooky stories will be included in both walks. “We are always pleased to present the Downtown Ghost Walk, and are very excited about the Cemetery Walk,” said DCCA Executive Director Andrea Jordan. “This is a great way for people of all ages to celebrate the season, learn a little local history, and have a lot of fun,” she continued. DCCA officials remind Ghost Walk participants that some tour sites include uneven terrain and may be dimly lighted. As in years past, the Downtown Ghost Walk will be held regardless of weather conditions; if seriously inclement weather occurs, the stories will be told at Memorial Hall. However, no appropriate alternative site is available at the Cemetery; therefore, bad weather will force a cancellation of the Cemetery Walk. 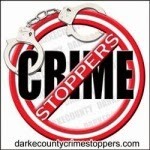 On October 27, 2018 from 10 a.m. to 2 p.m. the Darke County Drug Task Force along with Darke County Family Health, Darke County Solid Waste and the Drug Enforcement Administration (DEA) will give the public another opportunity to prevent pill abuse and theft by ridding their homes of potentially dangerous expired, unused, and unwanted prescription drugs. Bring your medications for disposal to Darke County Family Health at 5735 Meeker Rd. The service is free and anonymous, no questions asked. (MARIA STEIN, OHIO OCTOBER 17, 2018) - On Sunday, November 11th, the Maria Stein Shrine of the Holy Relics invites you to “meet the new neighbors”! Relics are not easy to acquire when one uses the proper, reputable channels and it's been 4 years since a new one has been added to the Shrine collection. St. Andre Bessette, St. Marianne Cope, BI Francis Xavier Seelos, BI Solanus Casey and St. Pope John Paul II will officially be welcomed to the Relic Chapel collection of Saints! This family-friendly event will begin at 1:00pm with games and crafts on the 2nd and 3rd floors. Saint inspired snacks and appetizers will be available in the Gathering Space on the 1st floor. Then, at 3:00pm, there will be a special prayer service and relic veneration. Founded in 1875, the Maria Stein Shrine of the Holy Relics provides faith nourishment and spiritual renewal through opportunities for prayer and pilgrimage and inspiration from the lives of the saints. We invite you to visit, explore and enjoy an environment rich in holiness and history. For Shrine hours and event information, follow us on Facebook, Instagram or visit www.mariasteinshrine.org. 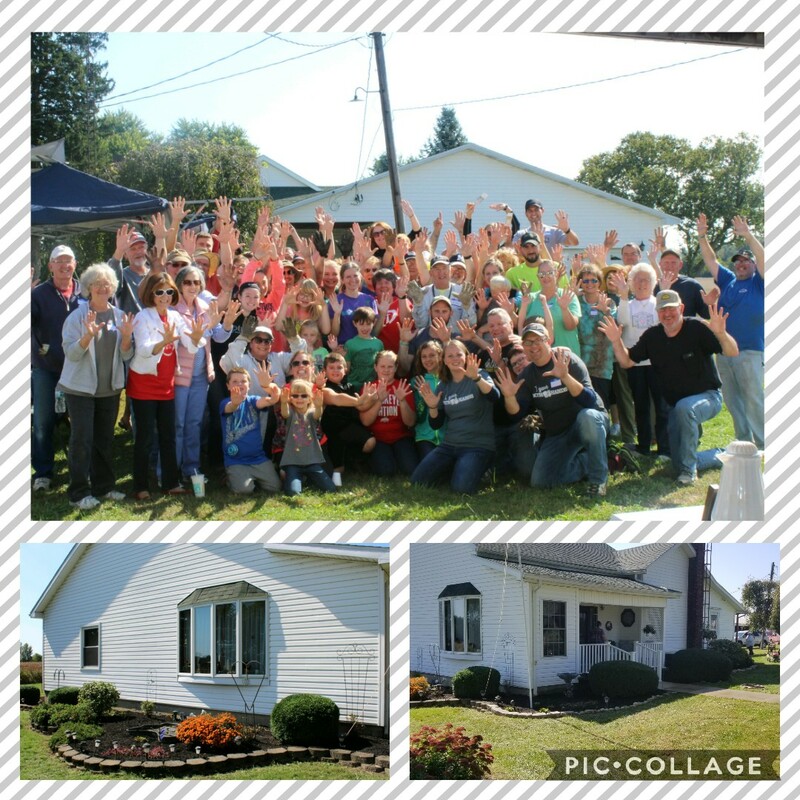 (MARIA STEIN, OHIO OCTOBER 17, 2018) - On Saturday, October 13th, the Maria Stein Shrine of the Holy Relics held a Women’s Day of Faith, Fun and Friendship. Over 20 different vendors had booths displaying various items from jewelry, beauty products, clothing, health & wellness items and baked goods. Visitors could stroll the vendor fair, the Shrine itself and attend any of the 4 special events. The day started with weekly 10am Mass in the Adoration Chapel. Immediately after, Julie Monnin, author of “The World is Noisy, God Whispers” held a faith formation presentation and book signing for a full Chapel of guests. Shortly after, the events continued with Theresa Nelson’s sold out lunch presentation in the new Upper Room “Natural Health in the Medical World and How Prayer Opened the Doors”. The busy day concluded with a special, rare art workshop by world-renowned artist, Tim Langenderfer. Twenty-one lucky participants received first-hand instruction from Tim and created a beautiful, faith-inspired fall piece of art. The funds raised from the day’s activities included a monetary donation to Rustic Hope, a non-profit in Russia that offers free support to single mothers before, during, and after delivery. “When this event was being developed, we knew we wanted to do something to give back to the community that has been so generous to us” stated Diana Russell, Director of Fund Development for the Shrine, “it was suggested that we should donate a portion of our proceeds to a non-profit that helps women, which was strongly supported by our vendors. They helped make this donation happen and for that we are grateful”. GREENVILLE, Ohio- On Thursday, October 25th, downtown Greenville will be transformed into a trail of Halloween treats for elementary school aged children. The Early Bird/BlueBag Media, Main Street Greenville, and downtown businesses are pleased to bring this safe Halloween event to the community! Main Street Greenville is a non-profit organization that supports downtown Greenville, Ohio through stimulating and supporting revitalization efforts, historic preservation and economic growth. Please visit www.downtowngreenville.org or www.facebook.com/mainstreetgreenville for more information about Main Street Greenville. If you have any questions, you can contact them at 937-548-4998 or info@mainstreetgreenville.org. Need some help researching your family tree? We have NEW, FREE databases to help! Join us at the New Madison Public Library in our Genealogy Room on Tues. Nov. 13 @ 1:00 PM or Fri. Nov. 16 @ 4:00 PM. We will share databases, websites, and tools to help organize your genealogy research. Please reserve a spot today by calling 937-996-1741 or emailing brenda@mymnpl.org. Executive Director of Main Street Greenville. GREENVILLE, Ohio- Main Street Greenville recognizes Edison State Community College as one of the Platinum Sponsors for the upcoming 15th Annual Hometown Holiday Horse Parade on Saturday, November 17th. The 2018 Hometown Holiday Horse Parade will feature entertainment leading up to the grand parade, which will begin at 7 pm. The lighted event includes 80+ horse entries and brings an estimated 8,000+ spectators into the downtown area. 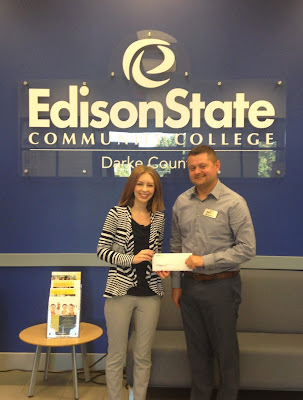 Now in its fifth decade of service, Edison State Community College is committed to providing higher education and advanced training opportunities for the people of the greater Miami Valley. Edison is accredited by the Higher Learning Commission and is recognized with the highest order attainable by the Ohio Board of Regents. With campuses in Piqua and Greenville, and plans to open two additional locations in Eaton and Troy, Edison State provides a Personal Experience and Rewarding Education. Visit us online at www.edisonohio.edu. Main Street Greenville also thanks the many other local businesses who help to sponsor this annual event, a full list of sponsors can be found on their website. This year's Platinum Parade Sponsors are Edison State Community College, Greenville Federal & Wayne Healthcare. Please visit www.MainStreetGreenville.org or follow them on social media for more information about the organization and the upcoming 15th Annual Hometown Holiday Horse Parade. If you have any questions, you can contact them at 937-548-4998 or info@mainstreetgreenville.org. DCRTA November Meeting: Darke County Retired Teachers Association will hold the November meeting/luncheon on Nov. 8, 11:30 a.m., in the Brick Room at BRC. The program will be presented by Crysta Hutchinson, Executive Director of Main Street Greenville. We will also be holding the annual Memorial Service for our members who have passed on this year. The meal (cost $11.00) will reflect a Thanksgiving theme of: turkey & dressing, mashed potatoes & gravy, glazed carrots, tossed salad, rolls, drinks, and EITHER pumpkin pie or carrot cake. Please indicate your choice of dessert when you make your reservation to Jean Kelly by October 26. The employees of the Darke County Sheriff’s Office, through the support of Sheriff Toby L. Spencer, and in conjunction with local law enforcement, fire, and emergency medical professionals have announced plans to host the 18th annual “Warm Winter Wear for Darke County Children” program. Thanks to generous donations from caring individuals and businesses within our community, “Warm Winter Wear” is able to provide all Darke County Schools with items they request for their students. New hats, gloves and coats are collected at the Darke County Sheriff’s Office from October 1st through the middle of November and items are distributed to the schools and local families as orders are filled. Monetary donations are accepted throughout the year; checks should be made payable to Warm Winter Wear and mailed c/o Darke County Sheriff’s Office, 5185 County Home Rd, Greenville, OH 45331. With the support and participation of the local K-Mart from 2000 - 2013, “Warm Winter Wear” was able to provide over 3,000 coats to children in Darke County. For the past four years, Wal-Mart has worked with us in helping to provide new coats, hats and gloves to children, ages 0-13, who are in need. With their support and participation over the last three years, the Darke County Sheriff’s Office has been able to provide almost 800 coats to children in Darke County. The Darke County Sheriff’s Office wishes to thank the numerous individuals and businesses throughout the County who have made donations in previous years. Last year we received $9,370 in donations. We also received donations of new coats, as well as hand-made hats, scarves and gloves. We greatly appreciate the generosity of our citizens; our program could not continue without your help. Anyone with questions about this project may contact the Darke County Sheriff’s Office at 937-548-1193, and direct your call to Stacey. Family Health's Behavioral Health and Wellness Center welcomes Jeanne Homan, MS, LPCC, LICDC and Danielle McKenzie, MSW, LISW as its newest behavioral health clinicians. Their practice is open to individuals, families, and couples for the treatment of depression, anxiety, and mood disorders. To schedule an appointment, contact the Behavioral Health and Wellness Center at (937) 547-2319. Family Health accepts most insurance plans and as a Federally Qualified Health Center can also provide services to patients with financial limitations. Darke County Center for the Arts will open its 2018-2019 Coffeehouse Series season on Thursday, November 1 at the Arts Depot in Union City by presenting “Kathakaar—The Spinning Storyteller.” According to DCCA officials, this performance is unlike any other presented since the inception of the casual Coffehouse Series. “Kathakaars were the bards of ancient India, communicating stories through dance, songs, and music,” explained DCCA Artistic Director Keith Rawlins. “Accomplished kathak dancer, tabla player, and ambassador for classical Indian arts Jin Won has created this spell-binding program that will fascinate audiences of all ages,” he concluded. The show starts at 7 p.m.
DCCA’s Coffeehouse Series presents high quality artists who perform in an inviting informal social setting where food and drink are also available. “The opportunity to enjoy these excellent artists up-close and personal is an important component of the appeal of our Coffeehouse shows,” said Andrea Jordan, DCCA’s Executive Director. “However, the friendly ambience and congenial atmosphere are also a big part of the attraction of this highly accessible series,” Ms. Jordan stated. Rodney Oda, Steve and Eileen Litchfield, and The Andersons are sponsors of DCCA’s Coffeehouse Series. The Ohio Arts Council helps fund this program with state tax dollars to encourage economic growth, educational excellence and cultural enrichment for all Ohioans. DCCA also receives operating support from the Harry D. and Esther Stephens Memorial as well as funding from the Ketrow Foundation, Lydia E. Schaurer Memorial Trust Fund, and the John R. and Miriam H. Knick Fund of Darke County Foundation. DCCA membership contributions also help support this show. Jin Won will also be performing a version of “Kathakaar—The Spinning Storyteller” for kindergarten through third-graders in all Darke County schools districts from October 29 through November 2 as part of DCCA’s Arts In Education series. Specific times for these performances, which are free and open to the public, are coordinated with the schools’ schedules; contact DCCA for more information. Tickets for “Kathakaar—The Spinning Storyteller” at the Arts Depot cost $10, and can be reserved by contacting DCCA at 937-547-0908 or dcca@darkecountyarts.org; tickets are also available online at www.darkecountyarts.org and will be sold at the door if any remain by showtime. In a two-part series of classes, the Craft Beer Education Series will look at the history of the Trappist order and the world's 12 certified Trappist breweries. The classes will be lead by Certified Cicerone David Nilsen. David will guide attendees through a tasting of beers from the world's Trappist breweries, explaining what makes each unique. Part one of the series will be held on October 30 and November 1 (identical classes), with part two on December 6 and a January date to be determined. These classes are free, but seats are limited and registration is required. Please call the Greenville Public Library at 937-548-3915 to reserve your seat. We hope to see you there! The Arcanum Public Library has many programs and events planned for the upcoming weeks. On Tuesdays, preschoolers can come to Storytime at 10:00 to listen to stories, sing songs, make a craft, and have a lot of fun. No registration is needed for this drop-in program. Also on Tuesdays, school age children can come for the afterschool program, SPARK, from 3:45 – 4:45. Kids can make a craft, learn something new, explore the outdoors, hang out with friends, and much more. This is also a drop-in program. On Thursday, October 25 at 6:30, the Library is pleased to be hosting a miniature garden workshop. Our host will show off a portion of her mini-gardens, and guide participants through the creation of their own. Patrons are asked to bring their own small container. Plants and dirt will be provided. There is no registration needed for this event. Join us Thursday, November 1 at the Tipp City Public Library at 11:00 for the announcement of the winner of our One Book, Many Communities book selection by State Senator Bill Beagle. On Tuesday, November 13 from 4:30 – 5:30 there will be an adult coloring session. Come on in to color in a relaxed atmosphere and chat with others as you create a masterpiece to take home. This is a drop-in program, and beverages are served. Also on Tuesday, November 13 at 5:30, the book club will meet to discuss “The Education of Dixie Dupree” by Donna Everhart and to pick up the next book. Newcomers are always welcome to join, and beverages are served. GREENVILLE - Pets in Darke County now have a better chance of surviving a fire thanks to the Darke County Friends of the Shelter. Losing a pet due to a house fire can be a devastating experience. As most pet owners leave their furry companions home alone when they go to work, pets are left to fend for themselves in the event of a house fire. Far too many pets die each year of smoke asphyxiation because EMS and/or fire departments do not have the proper equipment to revive them. All Darke County services now have the Wag’N 02 Fur Life Pet Oxygen Mask Kit which can be used on both conscious pets and on pets that need to be resuscitated. With the three different sized reusable masks animals of varying sizes can be saved. To most people, pets are considered part of the family and the Darke County Friends of the Shelter is proud to honor the companion animals in our community by keeping them healthy, happy and safe. As winter winds approach we are busy getting our homes as well as our bodies ready for winter’s worst. We stock up, we get our flu shots and pray for a mild winter. In the last Century, the citizens of Versailles had many choices where to shop for their medical needs. Thank to Merlin Collins we have many samples of their ware for you to enjoy. Yes, even “snake oil” was sold to keep our citizens healthy. 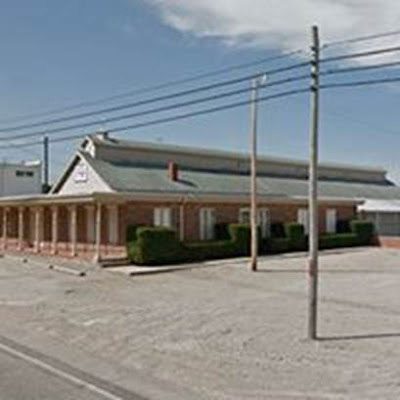 Some of the earliest stores had questionable practices like the Kusnick Drugs and Books. Mr. Kusnick passed through many communities on his way to Versailles. J.G. Sterlie Drug Store followed and after the 1901 fire Frankman Drugs, Central Drugs, followed and by the 1940’s Goodall Drug Store, Ward, Evinger, and Rexall followed. In more recent years Family Drug and Owl and filled our local needs and today Kaup Pharmacy helps to keep Versailles healthy. Stop by your Versailles Area Museum and learn about this fascinating part of our local history! This year marks the centennial anniversary of the first Veteran’s Day known for many years as Armistice Day. The Versailles Area Museum will commemorate this solemn occasion on Sunday afternoon November 11th with a special program remembering those from our area who answered their countries call in what was then called “the war to end all wars”. Our guest speaker will be Mr. Terry Purke of the Miami Valley Veteran’s Museum. Mr. Purke will be speaking on a short over view of the war but mainly its local impact on the communities. Our program begins at 2:00 p.m. 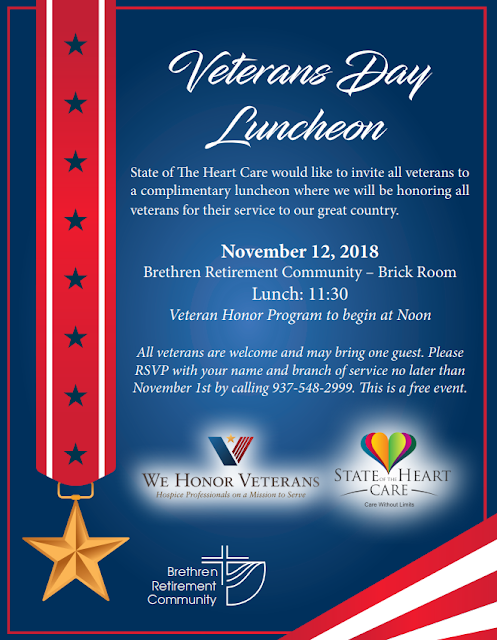 Following the lecture refreshments will be served and live music will be provided by a local group of Veterans known as the “Tin Caps”. A fascinating display known as “History in a Box” will be on loan for this day only from the Miami Valley Veteran’s Museum with WWI artifacts to share. We look forward to welcoming you for this special occasion at the Museum. Please save your dried hydrangeas and snowball flowers for the Versailles Museum Christmas project. We will be decorating soon and need these to help create for our Victorian Holiday. You may leave them on the Museum porch or drop them off any Sunday. On behalf of the Village of Versailles, Kyle Francis (left), Utilities Superintendent, accepts recognition of Honorable Mention in the System Improvement award category, presented by AMP President/CEO, Marc Gerken. COLUMBUS, OH: The Village of Versailles was honored for its achievements during the past year at the 2018 American Municipal Power (AMP)/Ohio Municipal Electric Association (OMEA) Conference. Scott Riley, Village of Versailles, received an AMP Hard Hat Safety Award. The Hard Hat Safety Award recognizes individuals in AMP member utilities that have contributed to safety within their community during the past year; have shown adherence to on-the-job safety procedures; and have promoted electric safety within their department and community in the past year. The Village of Versailles also received a System Improvement Honorable Mention for its Circuit #2, 12 kilovolt (kV) Conversion Project, which converted the utility’s four kilovolt circuits to 12 kV circuits, improving the reliability of power supply and providing cost savings. The annual AMP/OMEA Conference was held in Cleveland Sept. 24 – 27, and was attended by more than 300 municipal officials and industry representatives, with speakers from various national organizations. “The Darke County Park District is thankful for all of the support they receive in many forms from local citizens, property owners and merchants”, stated Deb Shiverdecker, Administrative Assistant. Just recently the Park District held their annual Prairie Days festival with over 5,000 people attending. Prairie Days is a free family event which combines lots of fun and learning all in one place. Along with historical interpreters who demonstrate how life was in the period around the late 18th century, the volunteers and staff plan crafts, host music groups, local Civic Theater performances and a local art exhibit and so much more for the enjoyment of the public. For quite a few years now local property and business owner (The Triangle Dance Club), Kelly Wilson, has allowed the Park District to park their Prairie Days visitors in their parking areas for free. The Park District then contracts the Greenville Transit to shuttle people to the Prairie Days event. Park District Director, Roger Van Frank stated, “Without this assistance the Park District would never be able to serve such large numbers of people at this very popular event as our parking is so limited at Shawnee Prairie Preserve.” The Darke County Park District would like to thank Kelly Wilson for the Triangle’s gracious donation and their long-time continued support of the community! The Ohio Peace Officer Training Academy at Edison State Community College is now accepting applications for the 22-week program that will prepare students for a career in law enforcement. Completed applications must be received by December 4. Physical assessment tests may be completed on either December 5 or 6, with the academy running from January 7 to June 15, 2019. Shown left to right are the the candidates for the 84th House District, Susan Manchester and Joseph Monbeck and the 80th House District, D. J. Byrnes and Jena Powell. 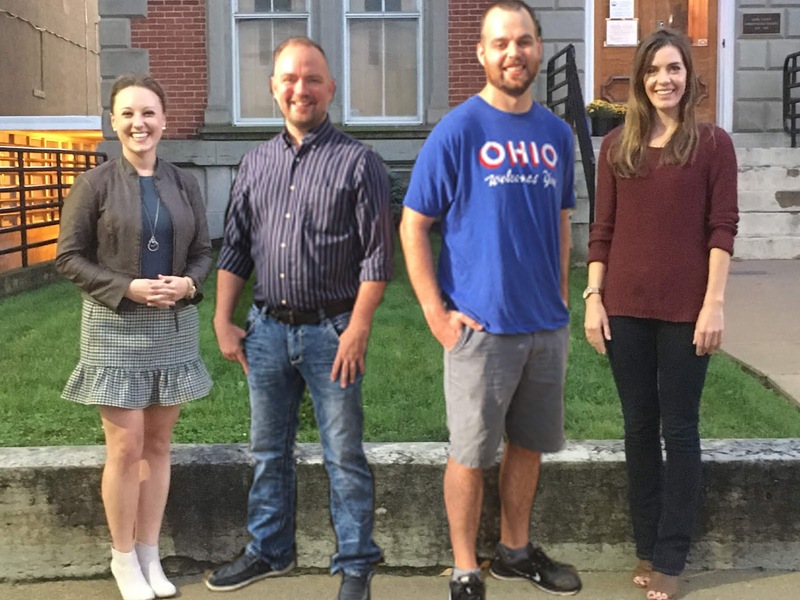 The League of Women Voters of Darke County is again sponsoring a Candidates Night on Tuesday, October 23 from 7:00 – 9:00 PM. Located at the American Legion Hall, Ohio St., in Greenville . The forum will focus on the contested races for the 80th and 84th House Districts. The evening will feature the House District candidates followed by information shared on State Issue 1 and the two local Greenville issues. After two minute introductory speeches, candidates will answer questions. The public is encouraged to attend and submit written questions. Questions are then screened by a panel of League members and presented to the candidates by a moderator. Other candidates may be present for a brief introduction only. The League of Women Voters is a non-partisan organization with the major purpose being to inform voters about the candidates and issues. Further information about the Candidates Night may be obtained by calling Holly Finnarn 937.417.4483 or Eileen Litchfield, 937.623.1234, Voter Service Co-Chairs. PLEASE REMEMBER TO VOTE ON TUESDAY, NOVEMBER 6. Volunteers from Big Brothers Big Sisters and their “Littles” recently enjoyed a Youth Day Fishing Derby at the home of Mike Meyer in Fort Loramie. The Fishing Derby was co-sponsored by the Shelby County BassMasters and Sidney Kiwanis. Over 25 volunteers and Littles attended the annual event, which was held on Saturday, September 29. The outing included a cookout for all BassMaster members, their children, and the Big Brothers Big Sisters volunteers and Littles. The fishing event concluded with an award ceremony for the top fisherman in several age categories. 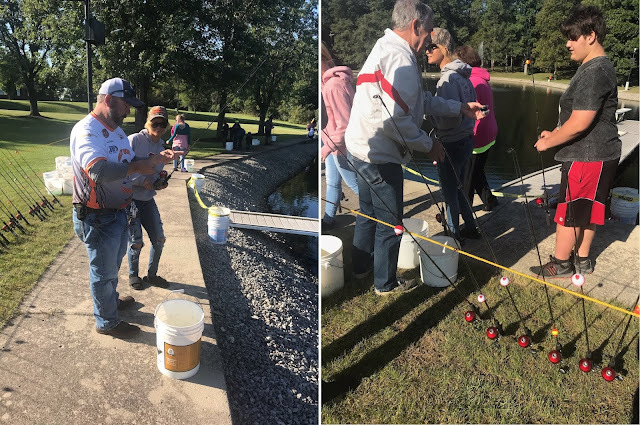 Shelby County BassMasters were able to put on this event as a result of local fisherman participating in bass tournaments throughout the year with a modest portion of the entry fee going toward the purchase of individual poles for each child. Other donations were received by Ohio Department of Natural Resources, Mike Meyer and Meyer’s Garage & Drive Thru, Mully’s Drive Thru, Al’s Bar & Grill, MidMark Corporation, Minster Journeyman’s Club, Sidney Kiwanis, Russ Michael Russ Michael, Vicky Tipps, Wagner’s IGA, Greenthumb Nursery, and Dan Eilerman Construction. On a beautiful Saturday morning, over 100 volunteers showed up at the home of a widow outside Greenville. They pulled weeds. They mulched. They painted. They power washed. They demolished a building. They did all this in the name of love. The congregation of Trinity Wesleyan Church in Greenville put this work project together, not only to assist a widow, but also to help a family in the church adopt a child. This is a Both Hands project. The idea behind Both Hands is to reach out both hands to help, one for the widow and one for the orphan. James 1:27 says, “Religion that God our Father accepts as pure and faultless is this: to look after orphans and widows in their distress…” Trinity Wesleyan is taking this verse to heart. Pastor Wes Lynch & his wife, April, have wanted to adopt a child for years. Through projects like Both Hands, they are very close to raising the finances they need to make it happen! Pastor Wes says, “I long to see the church come together and actually live out Scripture within the community of Greenville! We want to thank everyone who has been praying and supporting our family with our call from God to adopt little McKenna. Please continue to pray for our family as we walk in faith through our adoption journey. We currently are in need of $5,000 to be fully funded. Not everyone is called to adopt, but we are ALL called to take care of widows and orphans! (James 1:27). Both Hands’ mission is “to serve orphans, widows and adoptive families.” Both Hands helps families fundraise for their adoptions. 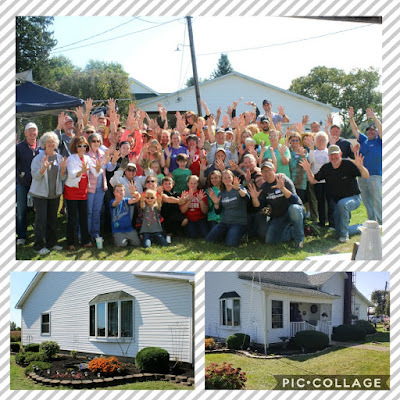 A family gathers a team of volunteers and Both Hands coaches them to coordinate a service project fixing up a widow’s home. The family and their team send letters to raise sponsorship for their day of service. 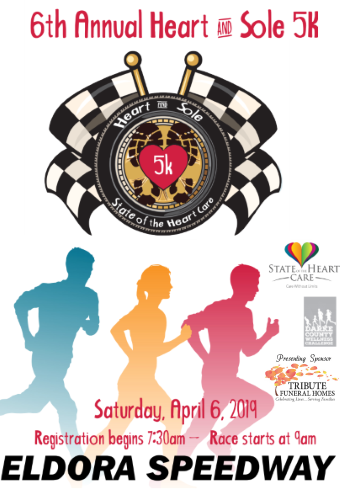 It’s very similar to raising sponsorship for a 5K race, but instead of running, the team is serving a widow. The funds raised help an orphan become adopted into a forever family. Both Hands – one hand for the widow, one hand for the orphan. 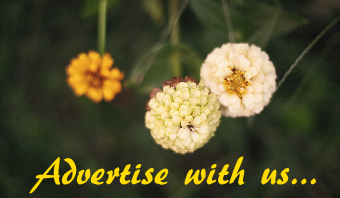 Committed to fundraising support for its operating expenses through private donors, no funds raised by a family and their team are deducted for Both Hands’ administrative costs. Since 2008, Both Hands projects have raised over $9.6 million for adoptions and orphan care. Through 830 Both Hands projects in 42 states, 916 widows have been served, 1,043 orphans are closer to forever families, and over 20,000 volunteers have served their communities. You can still help this family bring home Baby Makenna! For more details visit www.BothHands.org/Lynch-7734. The local Lowe’s Heroes group has again pulled together for the community in assisting the Darke County Park District in adding a bike repair and rest station at its new Bish Discovery Center located on Ohio Street in Greenville. Local Lowe’s employees Julia Crosby, Kenny Gross, Jimmy Kinnison, Dean Pflieger, Noah Waymire and Doug Littman helped design as well as supplied the materials and manpower to build the station shell in time for the Grand Opening of the Bish Center in July. “The bike station which now provides shade, bike racks and a fixit rack with a tool set and air for bicycle repairs was also partially funded by the Harry D. Stephens Memorial”, stated Deb Shiverdecker, Administrative Assistant for the Park District. A water bottle filler station will be added in the near future. Benches are available at the Center for weary trail users to rest on, providing the perfect rest stop for the Tecumseh and Greenville Creek Trails which run nearby. Darke County Park District thanks the local Lowe’s Home Improvement Store for its continued support of the community! Main Street Greenville is seeking vendors for this year’s Hometown Holiday Horse Parade, which will be held on Saturday, November 17th at 7 pm. Vendor spaces are available to both for-profit or non-profit organizations who would like to set up a booth selling seasonally appropriate snacks or drinks during the parade. Interested organizations need to contact Main Street Greenville at info@mainstreetgreenville.org or 937-548-4998 to obtain a vendor application. Deadline for submission is Friday, October 26th. Hurry, space is limited! Water. It is crucial to our survival and when we are hiking, whether Darke County Parks, or Glacier National Park, we should always carry our water bottles. But what if you are on a long hike and need to refill along the trail? Join a naturalist on Saturday, October 27 at 1pm at the new Bish Discovery Center (404 N. Ohio Street, Greenville) to learn the tools and techniques to filter your water on the trail. This informative, hands-on class will allow you a chance to get familiar with common methods and feel confident that when you are on the trail, you will have access to potable water. This class may require some short-distance walking and kneeling may be encouraged. The Darke County Park District would like to remind the public about the Down to Earth Book Club’s autumn selection. Each quarter the program will feature a different book, some by well-known nature writers, some about outdoor adventure, and even some about pioneers settling Ohio. Everyone is invited to read the book and join them at the Shawnee Prairie Preserve Nature Center to discuss the work, enjoy some yummy treats, and suggest future books. This season, the Down to Earth Book Club is reading Gene Everlasting: A Contrary Farmer’s Thoughts on Living Forever by Gene Logsdon. Containing the author’s thoughts on nature, death, and eternity he recounts his life on an Ohio farm. This season’s book club will meet on Monday, November 5th at 6:30pm at the Shawnee Prairie Preserve Nature Center. Please call ahead to let them know you plan on participating in the upcoming book club discussion. The Darke County Parks Nature Center can be reached at (937) 548-0165. COLUMBUS, OH – Beginning Tuesday, Oct. 9, hunters and anglers will be able to buy multiyear licenses in Ohio, according to the Ohio Department of Natural Resources (ODNR). Ohio resident license buyers can choose from 3-year, 5-year, 10-year and lifetime hunting or fishing licenses. All single-year and multiyear licenses can be purchased online at wildohio.gov and at hundreds of participating agents throughout the state if an Ohio driver license or state identification is associated with the customer’s account. Those interested in purchasing a lifetime license may apply online or at any of the ODNR Division of Wildlife’s five district offices or headquarters in Columbus. Locations of ODNR Division of Wildlife offices can be found at wildohio.gov. Lifetime licenses cannot be purchased at license agent locations at this time. All money generated from the sale of multiyear and lifetime licenses will be deposited into the Wildlife Fund, where it will be used to protect and enhance Ohio’s wildlife populations. A hard-plastic card will be provided to lifetime license buyers, and these cards will be available for purchase at an additional cost of $4 to customers who purchase a multiyear license. Cards will be mailed to the customer’s address in seven to 14 days from the purchase date. Destination Known Missions Ministry of EUM Church in Greenville, Ohio is in its thirteenth year partnering with the Potter’s House Association in Guatemala. Over the years, teams from EUM Church have built twenty homes for families that live in the garbage dump shanty communities. They have visited countless families in their homes to pray with them, and to share Jesus with them in real and practical ways by installing wood burning cook stoves, providing much needed food to families, and passing out Bibles. Destination Known wants to continue building homes for families in the shanty communities; however, due to the increased cost of building supplies, funding these homes has become more difficult. A Missions Gala will be hosted by Destination Known with 100% of the proceeds being used to build homes for families living in the Guatemala City dump communities. This will be a great time to dress up and enjoy an evening of dinner and dancing. This is an alcohol free event that will be held at Romer’s Catering in Greenville beginning at 7:00 pm on October 27, 2018. There will also be live and silent auctions with some great things to bid on. Items include a five night stay at Cumberland, a lawn glider, an Ohio State quilt, and many more! Tickets are on sale now! The cost is $35 per person. Tickets may be purchased at EUM Church, Romer's Catering, the EUM Church app, or online at www.eumchurch.org. If you are unable to attend but would like to make a donation, please make the check payable to EUM Church and mail to: EUM Church, 111 Devor St., Greenville, OH 45331, and put "Guatemala Missions" in the memo line. [Darke GOP Opening]: Republican Dignitaries, elected officials and Republican Party members gathered for the recent Official Grand Opening of its Party Headquarters at 606 South Broadway in Greenville. GREENVILLE - The Darke County Republican Party recently held a ribbon cutting ceremony in conjunction with the Grand Opening of its 2018 Headquarters. Among the Republican Candidates present were candidate for Ohio House District 80 Jena Powell, candidate for Ohio House District 84 Susan Manchester, candidate for Darke County Auditor Carol Ginn and candidate for Darke County Commissioner Mike Stegall. Many other dignitaries, office holders and Darke County Republicans were present to help with the festivities at 606 South Broadway, Greenville. Powell and Manchester addressed those gathered and presented a brief synopsis of why each is running for office on the Republican platform. Darke County Republican Central Committee Chairman Cindy Pike did the honors of cutting the official ribbon made from “Jim Renacci for Senate” stickers. The Honorable Jim Buchy was in attendance and provided an insight into why it is so important to elect Republicans in the upcoming election, helping to continue the freedoms that have been guaranteed under the Constitution of the United States. 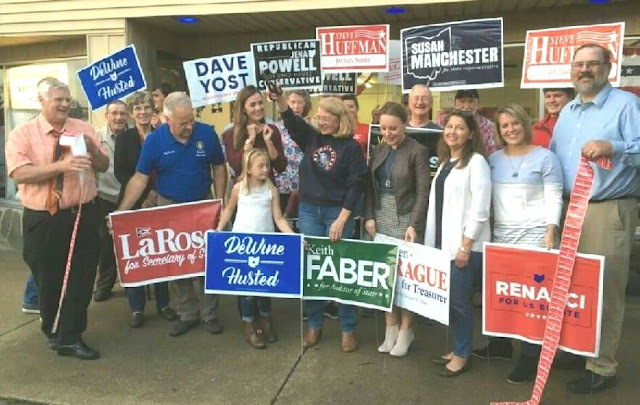 The Darke County GOP recognizes the November election is critical for Republicans across Ohio and the rest of the United States, therefore is opening the headquarters to promote success for Republicans at the polls in November. The Headquarters will be open from 3-7 p.m. every Thursday and Friday and from 8 a.m. – 1 p.m. every Saturday. Yard signs and information on Republican candidates will be available.